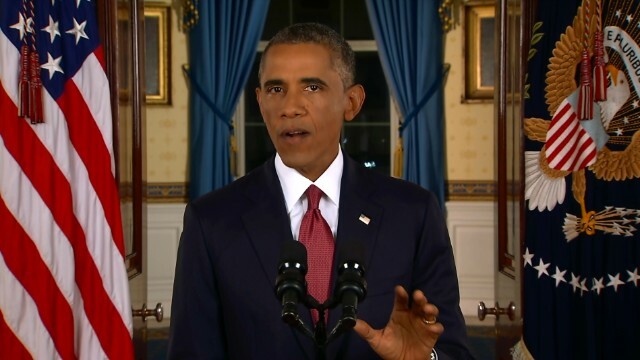 President Barack Obama says ISIS will find "no safe haven" as the U.S. military steps up military efforts. President Obama says it's time to go after ISIS. A former FBI director will investigate the Ray Rice case. And 40 million Americans are saddled with college loans. It's Thursday, and here are the "5 things to know for your New Day." "No safe haven": It's time to go after ISIS in both Iraq and Syria, President Barack Obama said last night in a nationally televised address. "Our objective is clear: We will degrade, and ultimately destroy, ISIL through a comprehensive and sustained counterterrorism strategy," he said. U.S. airstrikes have already been hitting the jihadists in Iraq. Those strikes will be expanded to ISIS targets in Syria, Obama said. Digging deeper: The NFL announced last night that former FBI Director Robert Mueller will lead an independent inquiry into the league's handling of the Ray Rice domestic violence case. Mueller will have access to all NFL records, spokesman Greg Aiello said. The National Organization for Women called Mueller's appointment "just window dressing," saying it doesn't go far enough. The group wants Commissioner Roger Goodell to resign. Another view: A video obtained by CNN captures the reactions of two men who witnessed the shooting of Michael Brown, the African-American teen killed in Ferguson, Missouri. One of them screams, "He had is f****n hands up," and then he motions with his own arms. The men say Darren Wilson, the officer identified in the shooting, was not the only officer on the scene. There were two others. The men, who asked not to be identified, said a second officer drew his weapon but did not pull the trigger. 13 years ago: On this anniversary of 9/11, folks are a lot more uneasy than they were three years ago. A new CNN/ORC International survey indicates that 53% of Americans believe it's likely for acts of terrorism to take place at this time, up from 39% in 2011 on the 10th anniversary of the attacks. Most Americans, however, don't feel personally threatened by terrorism. Just over four in 10 say it's likely that they or a family member will become a victim of terrorism. A heavy load: Carrying tens of thousands of dollars in student loan debt has become the new normal. Thanks to climbing tuition and inadequate college savings, 40 million Americans now have at least one outstanding student loan, according to a new analysis from credit bureau Experian. That's up from 29 million consumers in 2008. On average, borrowers are carrying roughly four student loans each, up from less than three in 2008. Meanwhile, the average balance has increased to $29,000 from $23,000. Ouch. - Is this any way to start a life together? Here's another group of groomsmen pretending to be in a boy band. - Furry protector: Nina the black lab runs interference for Dusty the hamster. - Toilet paper cannon: This is some good clean fun. - Cat sliding: This is Rigby the cat's favorite game. - Not standing around: Jeremy Lin surprises folks at Madame Tussauds in San Francisco. Corrections: 1. Obama ISIS- ISIL( ISIS) 3. " he had is ( his) hands up ". I hope mom made the two of them put every sheet of toilet paper back on the rolls. LOL!!!!!!!! Rigby has fun and exercise all at the same time. Too cute!!!!!!! !